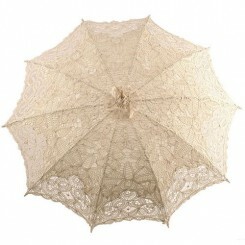 Our collection of wedding umbrellas & parasols. 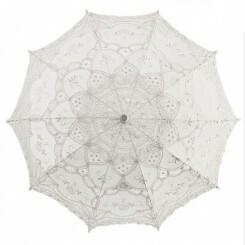 Come rain or shine we have the perfect, stylish solution to help you stay dry or keep your cool in our unpredictable weather! 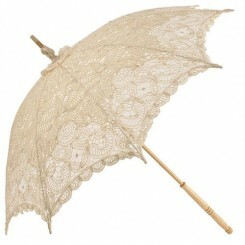 We have wedding unbrellas and parasols in a range of materials including beautiful Batterburg lace wedding parasols to add an elegant vintage touch to your bridal look – wonderful teamed with dainty lace gloves and a column style wedding gown. 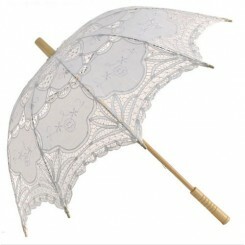 We also have childrens wedding umbrellas & parasols available – a delightful accessory for your flowergirls or bridesmaids.